It’s already public knowledge that 2018 was a record-breaking year for the UK in terms of low-carbon electricity generation. The year saw a record-breaking amount of new UK offshore wind capacity installed, while weekly and daily generation records were continuously smashed over a 12-month period. Somehow, 2018 was able to top the record-breaking year of 2017 for renewables, despite concerns that policy might stifle new installations and projects in the future. Today (28 March), BEIS published statistics confirming what we already knew, 2018 was a phenomenal year for low-carbon generation, which now accounts for more than half of total generation in the UK. The statistics arrive on the same day that BEIS revealed that UK emissions have now reached the same levels recorded in 1890, having fallen 3% last year. Statistics show this was largely driven by the ongoing phase-out of coal in the energy mix. The power sector delivered notable reductions, with emissions falling 10% on 2017 levels. Elsewhere the historically sluggish transport sector reduced emissions by 3%, largely due to improvements to fuel efficiency across the sector. The electricity statistics also highlight some interesting trends regarding wind, bioenergy, energy efficiency and nuclear deployment. Here, edie pulls the data to provide key trends and achievements in 2018. 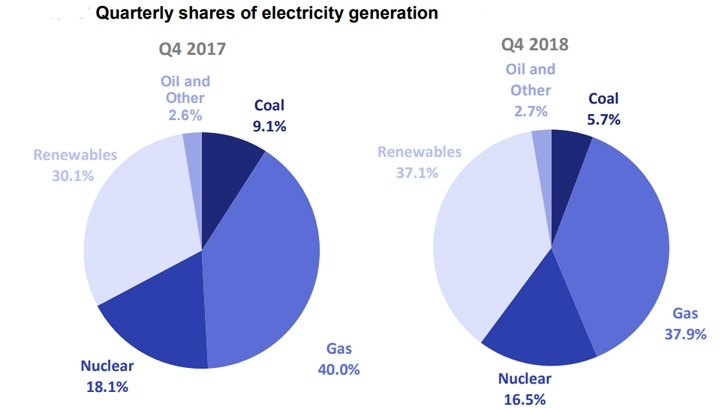 Overall, low-carbon sources (renewables and nuclear) accounted for 52.8% of total generation in 2018. This figure, according to BEIS statistics, is a “record high” and is 2.7% higher than 2017 generation. The achievement was driven by a growth in renewable capacity coming online and a decline in nuclear generation due to maintenance works. Coal’s share of generation reached just 5% in 2018, an annual decrease of 1.6%, while the share of gas generation was 1% lower than 2017 levels, at 39.4%, due to price volatilities. Renewables share of generation reached 33% in 2018, an increase of 3.9% compared to 2017. Due to the maintenance issues for nuclear generation, renewables were able to boost their share of the low-carbon generation mix to 63% last year – a 4% annual increase and up from 29% in 2008. Matthew Wright, UK Managing Director at Ørsted, said: “It’s encouraging that renewable electricity is now providing a third of total generation in the UK and carbon emissions continue to fall – but it’s concerning to see the pace of these reductions slowing down. Renewables share of generation for the last quarter of 2018 suggests that renewables could be set for even greater growth in early 2019. 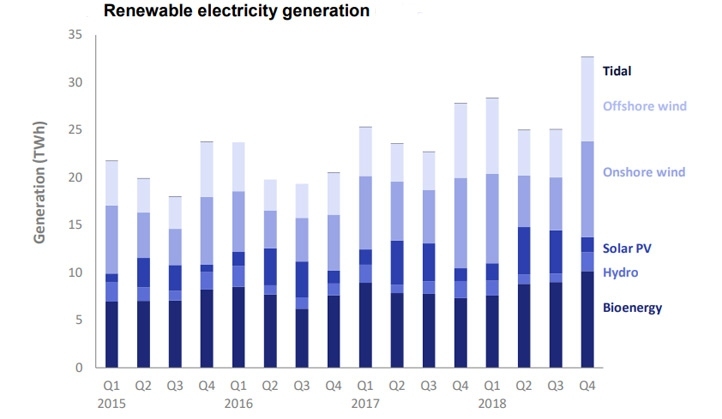 Renewables share of generation accounted for 37.1% in Q4 2018, a 7% increase on the same period the year prior. Gas, however, remained the dominant fuel type with a 37.9% share – although this was 2.1% lower than 2017 levels. Renewables also dominated the low-carbon mix in Q4 2018. Renewables accounted for 69% of Q4 low-carbon generation – a 7% increase on the same period in 2017. Nuclear generation, however, declined in Q4 2018 compared to Q4 2017, due to the “continuation of outages as maintenance work continued”. Nuclear generation decreased from 17 TWh in Q4 2017 to 15 TWh in Q4 2018 a fall of 12.9%. Renewable electricity generation reached record levels in 2018. Generation increased by 11.8% compared to 2017, growing from 99.3 TWh to 111.1 TWh, largely due to increased capacity. Renewable electricity capacity was 44.4 GW at the end of 2018 – a 3.9GW and 9.7% increase on 2017 levels. This was largely driven by increased offshore wind and plant biomass capacity. In 2018, generation from onshore wind increased by 4.6%, from 29.1 TWh in 2017 to a record 30.4 TWh. Offshore wind generation also reached a record level, increasing by 28%, from 20.9 TWh to 26.7 TWh. Wind provided a record 17.1% of the UK’s electricity last year (9.1% from onshore wind and 8% from offshore wind, both new annual records). RenewableUK’s deputy chief executive Emma Pinchbeck said: “These record-breaking figures demonstrate the unstoppable momentum for renewables, with spectacular global cost reductions in onshore and offshore wind, as well as battery storage, being reported this week by Bloomberg New Energy Finance. “We need Government to fully recognise that renewables are the future in our energy policy - from fair markets for flexible power and innovation funding for new technologies, to removing the obstacles in the way of our cheapest form of generation: onshore wind." Hydro generation actually decreased by 7.8%, from 5.9 TWh to 5.5 TWh, compared to 2017. In 2018, generation from bioenergy increased by 12%, from 31.8 TWh in 2017 to a record 35.6 TWh largely due to generation from plant biomass, which increased by 21% from 20.1 TWh to 24.3 TWh. 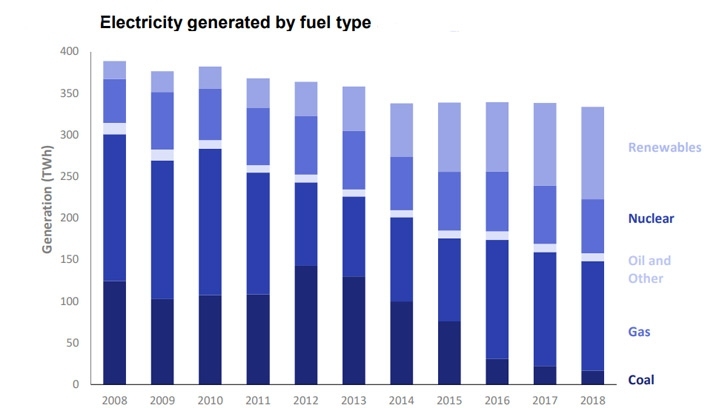 As well as an uptake in renewables, the UK was actually able to decrease the electricity generated and consumed in 2018. Total electricity generated fell from 339 TWh in 2017 to 334 TWh in 2018, a decline of 1.4%. This was also the largest year-on-year decline since 2014. In total, electricity generation has fallen by 14% since 2008, while coal generation has fallen by 86% in the same timeframe to 17 TWh. Since 2008, final consumption has decreased from 342 TWh to 301 TWh - a 12% improvement in electricity consumption. The largest annual reduction was recorded in 2014, where consumption fell by 4.3% over a 12-month period. Industrial consumption (including iron and steel) has fallen by 19% since 2008 to 92 TWh, while transport consumption is now 4.3% lower than 10 years ago. Domestic consumption was improved by 12%, with BEIS attributing the fall in use to warmer temperatures and energy efficiency measures. Scotland enjoyed a record year for renewables according to the statistics. The equivalent of 74.6% of gross electricity consumption in 2018 was from renewable sources. Generation in Scotland reached 26,708 GWh, a 6.1% increase on the previous record in 2017. This output is the equivalent of powering all Scottish households for more than two-and-a-half years. Total renewable capacity increased from 10GW to 10.9GW, with electricity generated via offshore wind playing a huge role - capacity and generation both more than doubled compared to 2017. Generation increased from 616 GWh in 2017 to 1,369 GWh in 2018, while capacity increased from 246 MW to 623 MW. Scotland’s Energy Minister Paul Wheelhouse said: “Despite damaging policy changes from the UK Government since 2015, particularly in terms of impacts on onshore wind, we continue to provide strong support for Scotland's renewable energy sector. Generation and infrastructure investment continues, not least because of the importance in preventing the damaging impacts of climate change. "We will ensure the correct strategic decisions are taken to further support this highly valued sector, despite the difficulties created by unhelpful decisions at Westminster." 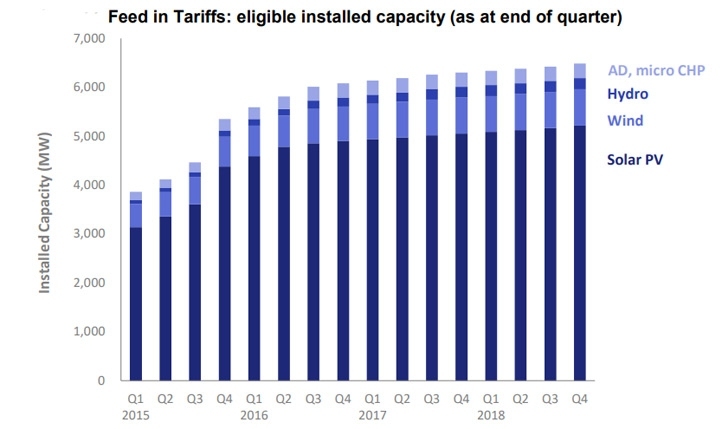 The BEIS statistics provided quarterly updates on the capacity of renewable energy installed that was eligible for the Feed-in Tariff (FiTs) scheme. As of the end of Q4 2018, 6.5GW has been installed and eligible for FiTs since it was introduced in 2010. Q4 2018 recorded a 0.9% improved (58MW) on installations compared to the previous quarter and a 2.9% (180MW) increase on Q4 2017. In total, 89% of FiT capacity installed in 2018 was solar PV and a total of 961,448 installations have been recorded as installed and eligible for FiTs, a 1.3% increase on the 949,181 installed at the end of the previous quarter, and a 4.2% increase on the 923,101 installations a year earlier. However, the closure of FiTs occurs this weekend (31 March), after which new installations won't receive payments towards the renewable electricity generated. While the first quarter of 2019 could like see a flurry of new capacity come online to benefit from FiTs, from April 1 2019, the scheme closes to all new applicants. The industry is concerned that the closure will impact community solar schemes, but a smart export guarantee (SEG) programme is being introduced so that households and businesses installing new solar panels will be guaranteed compensation for any power provided to the grid.